Over the weekend (22 – 24 March 2019) ACGL operated the Official South African FIFA and SAFA National Championships for the FIFA eNations Cup 2019. The event is officially sanctioned by SAFA and FIFA. 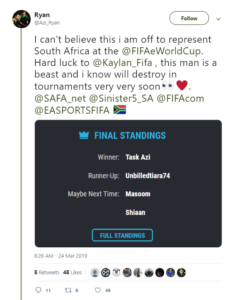 The qualifiers would see just two South African players (one on PS4 and XB1) progress to London to represent South Africa on 13 and 14 April 2019. There is a prize pool of $100,000 up for grabs in London, as well as EA SPORTS FIFA 19 Global Series Points. The PS4 winner was Goliath Gaming‘s Thabo “YvngSavage” Moloi. He progressed through the main playoff bracket, scoring more than 5 goals every match he played. He faced KingCJ0_ in the finals and emerged victorious 7-5. 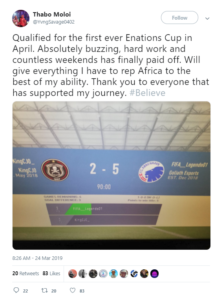 YvngSavage was considered one of the favourites to win the PS4 tournament after his major victory at the VS Gaming FIFA event in 2018. Alternatively for Xbox One it was Sinister5‘s Ryan “Azi” De Oliveira Bastos who emerged victorious over the weekend. Like his PS4 counterpart, Azi also set some emphatic goal margins on his way to the finals. There he faced Unbilledtiara74 in what would be a hotly contested final. Azi pulled off a 2-1 victory to book his spot in the London 2019 FIFA eNations Cup. South Africa has been drawn in Group A featuring teams like England, France and Saudi Arabia. All three of the opposition teams feature some high ranking players in FIFA 19, with Saudi Arabia likely to feature Mosaad ‘MSDossary’ Aldossary who won the 2018 FIFA eWorld Cup. Congrats to the winners and good luck in London!